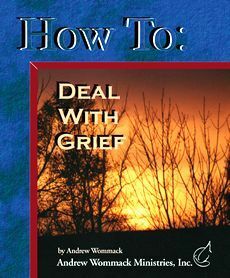 Grief is something that each one of us encounters sooner or later. It cannot be avoided, but it can be dealt with in a positive way. Some of the most influential people in history became better and more compassionate because of the way they dealt with grief; others were thrown into a destructive spiral. This series will help you to come out of grief on the victory side. If the devil can make you think, "Nobody knows the trouble I've seen," then you will refuse all the help others have to give. You will exempt yourself from the answers of God's Word, thinking you are an exception; but there isn't anything fighting against you that isn't COMMON to mankind. Satan only fights us in three ways-he just wraps his lies in different packages and bows, but the contents are the same. That's why it came - to pass. Everything life and the enemy can throw at us is only temporary. Realizing this will shrink your grief down to a manageable size. Someday soon, the problems of this life will be a distant memory, swallowed up in the compensation of God's love and blessings. Wrong teaching that has placed all events under the control of God, has made many people bitter towards the Lord, and others passive towards their problems. God is not the source of our problems. Knowing this will keep us in a positive relationship with the Lord, and will enable us to fight through, instead of submitting to our hardships. God is faithful. He has never failed a single one of us. This sounds like an unkind and heartless way of ministering to someone in grief, but the root of all grief is selfishness. The impact grief has on us and how often we experience that grief will dramatically diminish when we realize this; and in life's true trials, where grief is normal, loving others and God more than ourselves will bring us out of grief and into the light of God's comfort quicker.